It appears that Fine Gael has received a massive endorsement for their plan of a change of leadership over the past few weeks, at the expense of Fianna Fail. Fine Gael secures 29% of the first preference vote, an increase of 5% in one month, as attention is focused squarely on Fine Gael and its leadership contest in the media during the fieldwork for the poll. These gains for Fine Gael appear to be taken directly from Fianna Fail. The party secures just 21% support, a decline of 7% in the past month. This is the lowest level of support the party has secured since before the last election, as those under 35 practically desert the party. Sinn Fein also suffer as a result of Fine Gael gains, with drop in support of 3% since last month, leaving the party on 14%. While Independent candidates and the Independent Alliance make gains. It is important to note that in the RED C polls we read out all parties that are standing in a possible election over the phone, to ensure that voters are reminded of all the options available. This appears to lead to a more steady support levels for Independent candidate sand smaller parties, compared to the last election, than seen elsewhere. By the time fieldwork started on the poll last Friday night, it was already pretty clear that Leo Varadkar had a significant lead over his rival Simon Coveney, with the declared support of 40+ TD’s and Senators. A level of support that was unlikely to be overturned by votes among the wider membership. However the poll shows that either Coveney has had the better campaign in the eyes of the public, or the public like the Irish tradition of backing the underdog in a fight! In all the polls RED C has conducted up to this point on the leadership Varadkar has led his opponents by some margin, on most aspects, and crucially always in terms of best Taoiseach. With just the two of them left in the race it appears Coveney has made some considerable gains. 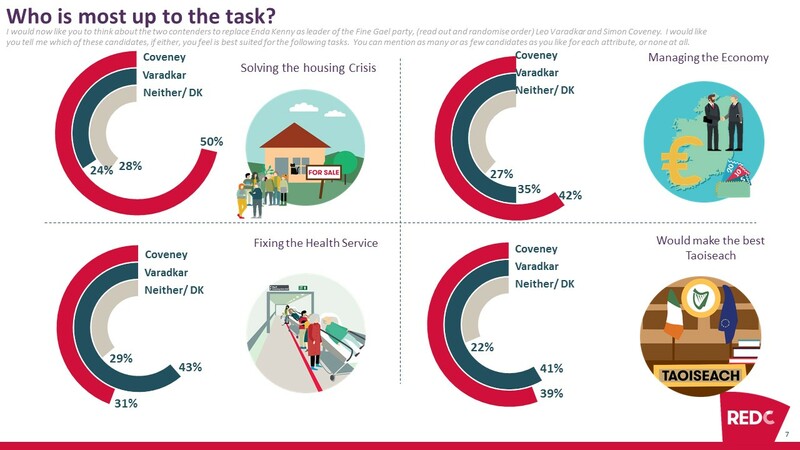 In our latest measures Coveney outperforms Varadkar in terms of public support for best to manage the housing crisis, which perhaps isn’t a surprise given it is his current remit – but given the difficulties in solving that crisis we might have expected him not to do as well on this issue. But crucially he is also seen as the best to run the economy, by 42% support among the public vs Varadkar at just 35%. Varadkar however does still hold on to securing the most support as being seen to be the best Taoiseach measure, securing 41% backing compared to Coveney’s 39%. This is 1% gain for Varadkar, and a 5% gain for Coveney in the past month. So while Coveney has made significant gains in respect among the public during the campaign, Varadkar is also holding his own among the public at large. Varadkar also secures far more backing in terms being the best candidate of the two to fix the health service. Of most interest however, is the fact that while Coveney is ahead on the best Taoiseach ratings among past Fine Gael supporters, it is clear that the new gains for Fine Gael support are largely down to Varadkar. He is ahead on the best Taoiseach measure among those claiming they will vote Fine Gael if there was an election tomorrow, and dominates this measure among switchers to the party, providing clear evidence that he is the reason for broader appeal for the party outside those who were already staunch Fine Gael supporters. Movement of support to Fine Gael has occurred across regions and demographic groups, but crucially there appears to have been a groundswell of support for the party among younger voters. A massive increase in support is recorded among 18-34 year olds, while there are also gains seen among more working class voters for the party. Form a party perspective a large chunk of those who voted for Fianna Fail and Labour at the last election, have also moved support to Fine Gael for now. So early signs are that the change in leader will bring about a significant bounce for Fine Gael, but it should be borne in mind that these figures are at a time when the focus is almost exclusively on the party and the candidates. Given gains are mainly among younger voters, who are perhaps more fickle and likely to switch, the challenge will be holding on to this support in the medium term.